Printable chore lists make household organization a real possibility. When each family member knows which chores he is assigned on a given day, arguments and miscommunications can be avoided. Lists of chores suitable for kids at different ages get everyone on the same page about what's expected in terms of household maintenance from each family member. Use these in conjunction with chore charts or keep them visible and allow the freedom of choosing how to help out and when. 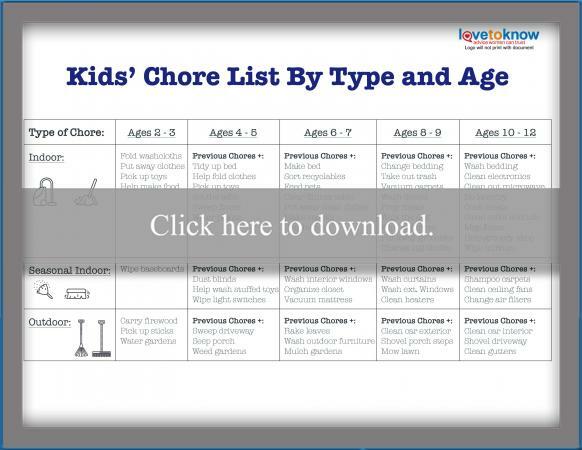 If you need help downloading the chore list printables, check out these helpful tips. Choose from easier tasks for kids under age 8 or more difficult ones for kids under age 13 on this printable chores list that can double as chore cards. Each section features one room of the house, such as the kitchen or bedroom, and three tasks kids can complete for that room. 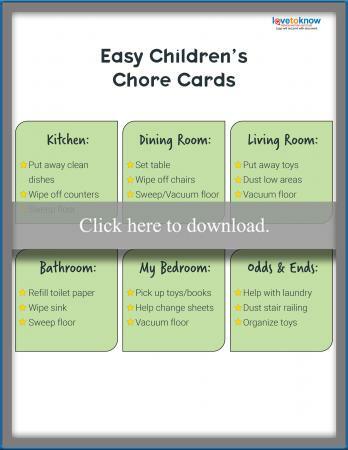 If you print and cut out each section to use as chore cards, kids can randomly draw a card and choose which chore they want to complete at that time. This can help siblings feel like chore distribution is fairer because it is a game of chance. Kids can start helping with chores as soon as they are mobile and able to understand what you're asking. As they grow, so will the pool of chores they can help with. This chart show suggestions for indoor, seasonal, and outdoor chores kids can do in each age range from 2 to 12. Teenagers can complete these chores along with more difficult tasks. 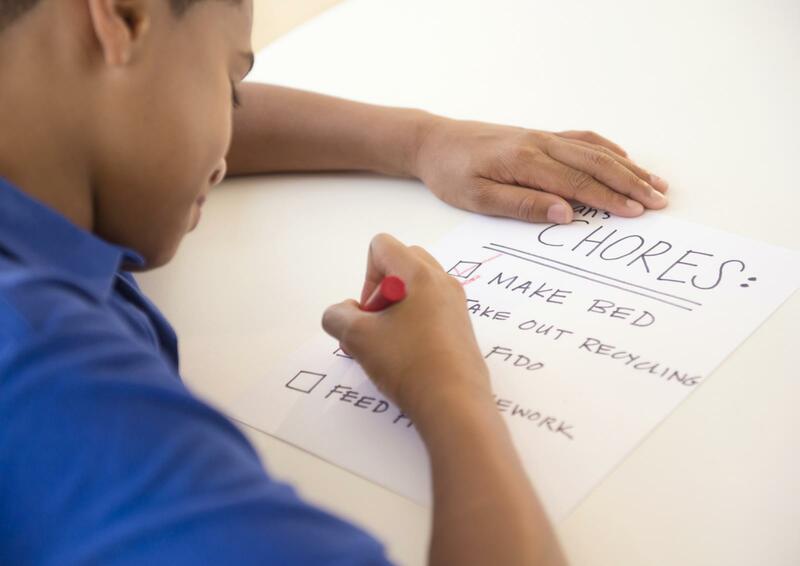 If you've got multiple children, a chore list diagram can help illustrate what chores everyone can help with. 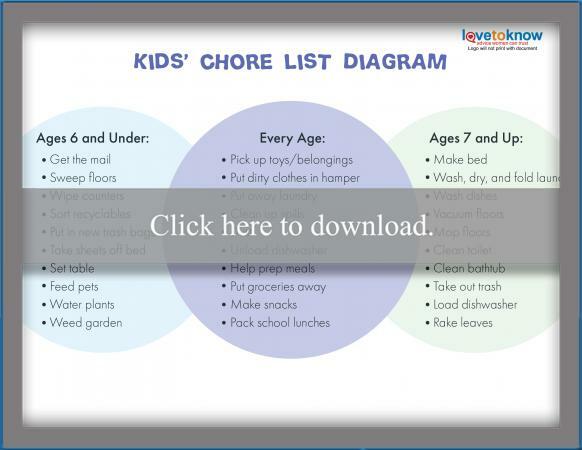 The list in the center circle describes tasks all kids can complete while the outer circles highlight chores for kids age 6 and under or kids age 7 and older. No matter what your daily schedule looks like, there are simple tasks kids can help with each day to keep the household tidy. You may be able to think of the obvious, standard chores, but these unique tasks can help break up the normal chore routine. Kids can also help with deep cleaning tasks and other chores you only complete on a monthly or occasional basis. If you live in an area that sees major weather changes from season to season, there may be quarterly chores kids can help with. Prepare the house and outdoors for warmer weather with these chores. Get ready for colder temps and snow with these tasks. Help your child add items from the printable chore lists to these fun chore charts to motivate them to do their fair share. Family chore list: This chart has a list of household chores with blanks under the days of the week. Just add the name or picture of the person assigned to each task. 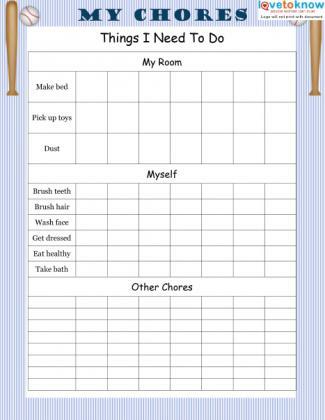 Blank princess chore chart: This chart features a cute princess and blank spaces for you to write in your child's daily chores. Basic blank chore chart: This simple chart features a blue border and blanks for names and chores. Dog chore chart: This blank chore chart features a brown dog and a bone. Rainbow horse chart: Another blank chore chart, this one features a horse with a rainbow-colored mane and tail. Baseball chart: This colorful chore chart has a blue background and a baseball theme. It includes a list of common chores. Cooking, cleaning, and yard work are life skills everyone needs to learn if they plan to live on their own. Help your kids learn these skills along with the value of teamwork when you ask them to participate in household chores appropriate for their age. Some kids may be able to move onto harder tasks sooner than others so be sure you account for your child's developmental level when assigning tasks.